Fresh from an outstanding performance at RiverFest – Come join us on Sunday, October 4th to hear and enjoy Dixieland music as played by Old Town’s “Six Basin Street”. 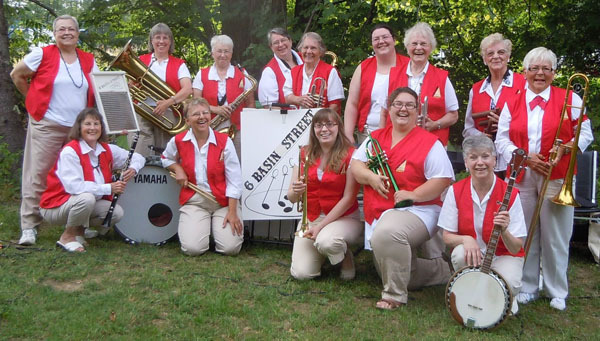 Six Basin Street is Old Town’s only all woman Dixieland Jazz Band that plays music for the purpose of having fun and entertaining others. The band’s name comes from a tune in the original 1991 play list, Basin Street Blues, which has remained a favorite through the various versions of the band. Sunday, October 11, 2015 – At 4:00 pm, the Old Town Museum closes for the normal 2015 season. On request, the Museum can be open for groups or special activities.